The data was added on ,	5 September 2017 read 448 times. The Syrian army soldiers repelled terrorists’ attacks on their positions in Hama province after hours of clashes, inflicting major losses on them. The terrorists’ offensives to capture the government forces’ positions in Hama were fended off by the strong defense of the Syrian military men. Meantime, the Syrian army and popular forces continued their military advances in other parts of Syria, including Deir Ezzur, over the past 24 hours. Tens of terrorists were killed and dozens more were injured during the Syrian army’s operations in Syria’s key provinces. The Syrian Army troops, backed up by the country’s Air Force, repelled ISIL’s heavy offensive in Eastern Hama on Monday, inflicting major losses on the terrorists. The army men engaged in fierce clashes with ISIL that stormed the pro-government forces’ positions in the village of Jarouh from their positions North of Aqayrabat and managed to fend off their attack. ISIL suffered heavy casualties in the clashes. Also, the army aircraft pounded the defense lines of ISIL in the villages of al-Hardaneh, Tal Admeh and al-Asafereh near Aqayrabat, killing and wounding a number of terrorists and destroying their equipment. Earlier reports said that the army soldiers stormed ISIL’s positions in Eastern Hama and took back the village of Mas’ada, Rasm Qanbar farm and its surrounding regions after fortifying positions in the newly-captured town of Aqayrabat. The army men further managed to advance to the regions near the village of Hamadah Omar that is one of the important villages still controlled by the ISIL. In the meantime, Human Rights Watch reported that 120 terrorists have been killed and tens of others have been injured in clashes with the army units in Eastern Hama in recent days. The Syrian army forces continued operations to break the terrorists’ siege on Deir Ezzur, regaining control of a new region. The army soldiers engaged in heavy clashes with the ISIL terrorists in Western Deir Ezzur, retaking control of an asphalt workshop in the region. According to military sources, the army troops are just 3km away from ISIL’s main lines around Deir Ezzur, specially Brigade 137 in the Western parts of the city. Earlier on Monday, the Syrian army troops, backed up by the Russian Air Force, continued to advance against ISIL in the Eastern province of Deir Ezzur in several flanks despite massive redeployment of ISIL’s fighters and military hardware from other parts of Iraq and Syria to Deir Ezzur, military sources confirmed. 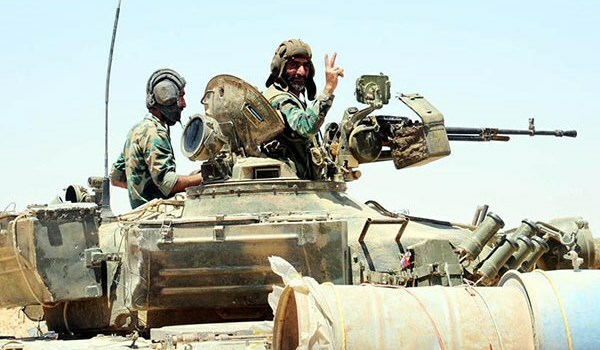 The sources said that the army soldiers drove ISIL out of the towns of Kobajeb and al-Shoula and several strategic hills, pushing towards Brigade 137 base in the Western outskirt of Deir Ezzur city. They added that the army men captured al-Kharateh energy field North of Tar Tarfawi region in the Western countryside of Deir Ezzur city, deploying less than 20km away from Tal (hill) al-Sonouf near the city airbase. A large number of ISIL terrorists have left behind their arms and equipment and have fled the battlefield amid rapid advances of the army. The sources went on to say that the army forces have reached areas 10km away from Brigade 137 base, adding that the army is on the threshold of lifting ISIL’s siege on Deir Ezzur after over three years. The Syrian Army troops continued to hit the positions of Al-Nusra Front (Tahrir al-Sham Hay’at or the Levant Liberation Board) in Eastern Ghouta and managed to seize control over a passageway that connects Jobar to Ein Terma region. The army men imposed control over Harmaleh passageway between Jobar and Ein Terma that was one of the main supply lines of Al-Nusra in the Eastern countryside of the capital. Also, the army soldiers pushed Al-Nusra back from several buildings and positions South of Ein Terma parallel to al-Mat,halaq al-Janoubi region. The army units further detonated a tunnel under a network of tunnels that had lined terrorists’ positions East of al-Mat’halaq to the depth of Jobar, killing tens of terrorists.